Hair loss or the medical term alopecia can occur in both women and men. This can result in psychological distress such as decreased confidence and self-esteem. Here at The Hairfront, we understand how this can make you feel and we are here to help you find a solution. Take a look at the various causes of hair loss below. 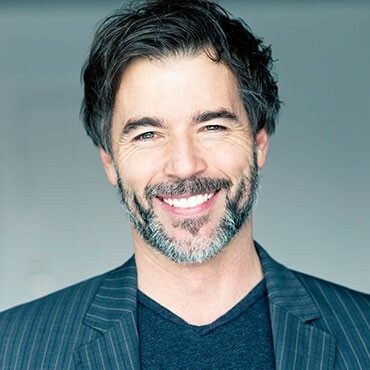 We will be able to assist you in finding the reason for your hair loss, as well as guiding you towards restoring your appearance and confidence. This is a complex cause of hair loss and the most common in men. In summary, it involves a derivative of testosterone called DHT affecting the growth of the hair. DHT binds to the hair follicles and makes it impossible for the follicle to grow or survive. 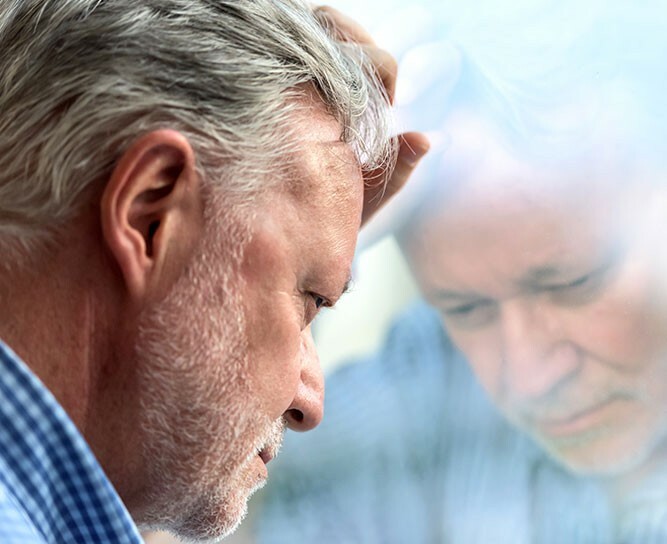 Read below “Male Genetic Hair Loss” for more information. Genes from both parents can predispose a person to hair loss. 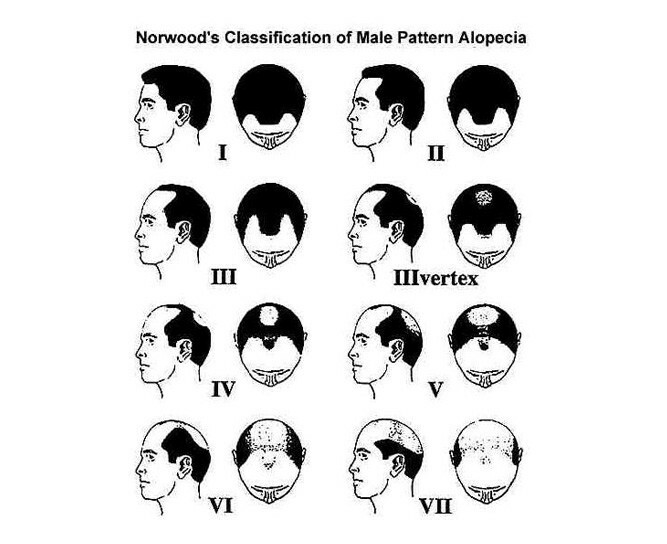 Male Pattern Baldness or androgenic alopecia is the most common result. See below for more information. As hair is made up of protein, a diet that is protein deficient can reduce hair growth. The lack of Vitamin C/B/E can affect hair growth, but these are usually sufficiently present in a normal balanced diet. Regarding Zinc or Biotin supplements, there has not been any good evidence that these supplements offer good benefits to hair growth. Cosmetic procedures have the potential to make hair weak and brittle. This includes bleaching, dyeing and too frequent shampooing. Rollers and tight braiding can also impact the hair strength. However, in most cases the hair continues to grow normally once the problem is stopped or removed. In extreme cases, the hair or scalp can be damaged and cause permanent bald patches. Regarding autoimmune diseases, the body attacks and damages it’s own tissue. Common examples include Rheumatoid arthritis, psoriasis and Type 1 Diabetes. In alopecia areata, the body attacks the hair follicles specifically. With correct treatment, usually the hair grows back, but in the early stages it may have a very fine texture and even a different colour. Various medical diseases can cause hair loss, these include diabetes, eating disorders, thyroid disease, lupus and iron deficiency anemia. Hair growth usually recovers when the condition is treated, however sometimes there can be residual scarring. Stress, illness, and childbirth can cause temporary hair loss. Stress is a well documented cause of hair loss, the resolution of which usually results in regrowth of the hair. Various medication has the potential to affect hair loss. Most of the time, the effects are temporary. These medications include chemotherapy for cancer treatment, blood thinners, certain types of blood pressure medication an well as birth control pills. Burns, injuries, and X-rays can cause temporary hair loss. Unless a scar is formed, the hair usually regrows normally. 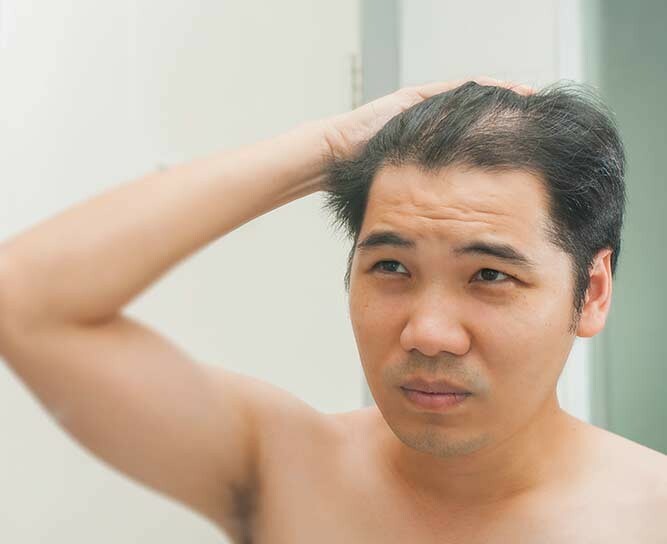 Male pattern baldness (MPB) also know as androgenic alopecia is the most common form of genetic hair loss and affects over 50% of males over the age of 50. Female hair loss is unfortunately not as well understood as male hair loss and it is believed to be caused by many contributing factors. 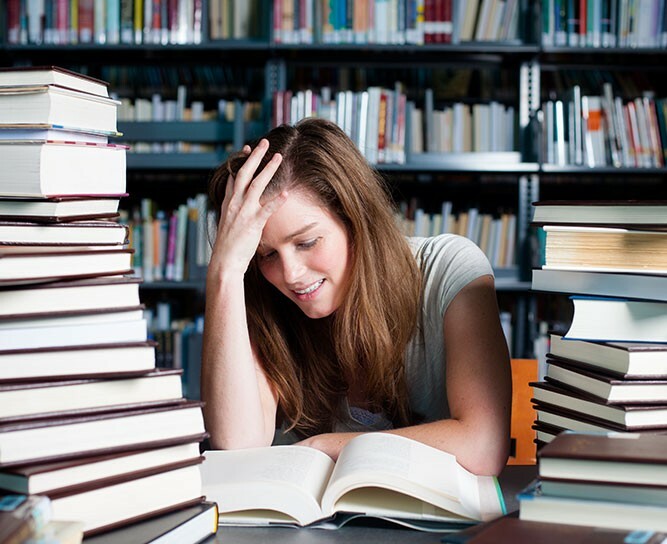 The main causes include genetics, stress, diet, drugs and hormone levels. 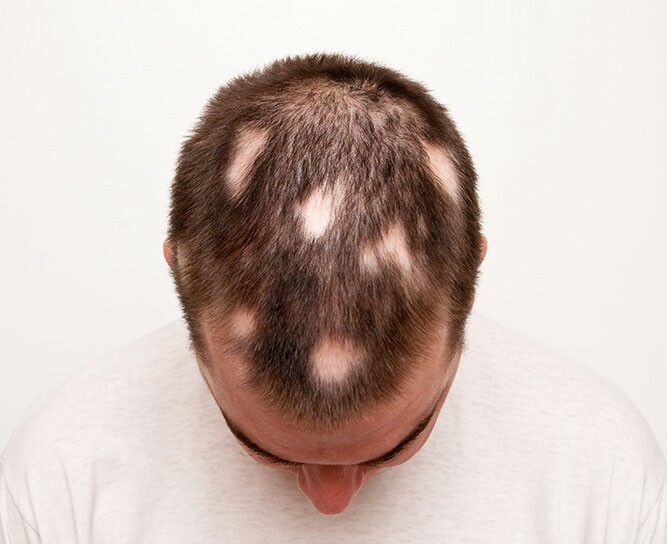 Alopecia Areata is a form of hair loss that follows no particular pattern and affects about 1 in 1000 people. 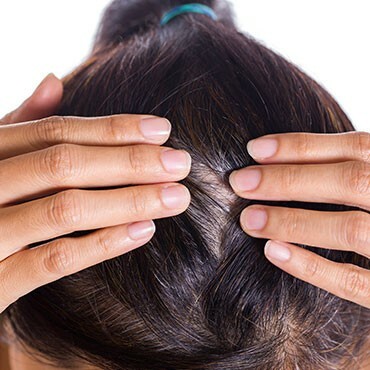 The hair loss is patchy and is auto-immune related, similar to asthma and eczema in the fact that the condition can come and go with different severities. 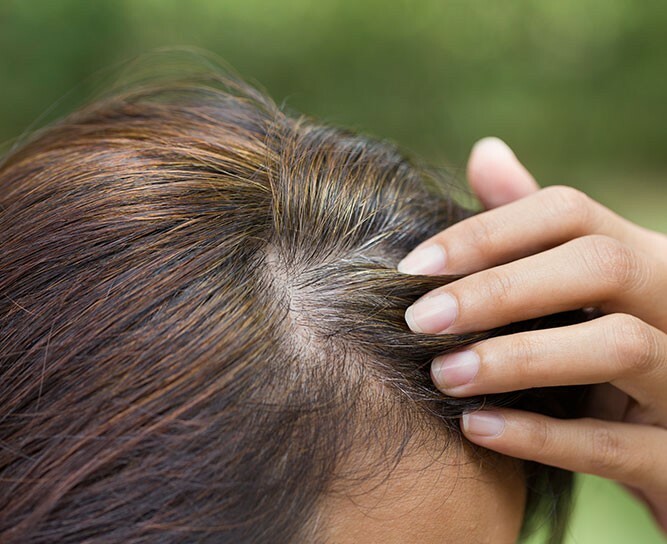 Telogen Effluvium is just a fancy term for hair loss and hair thinning that occurs when the hair follicles fall out during the resting phase of hair growth. This type of hair loss commonly affects the crown area and is acute and self-limiting. This is a form of hair loss that occurs from the patient pulling on their hair. It is a psychiatric condition and is related to anxiety and impulse control disorders. If you are pulling out your hair, unfortunately, we cannot help but we can assist by giving you an appropriate referral. Our team of hair restoration specialists are here for you. Hair restoration surgery has come a long way since the turn of the 20th century. Gone are the days of unnatural looking results or the “doll’s head” appearance. As your own hair is used for the hair transplant and because each hair is placed individually, the results appear completely natural. It is important to select your surgeon carefully for hair restoration, as his/her experience will determine the success of the results. For example, the placement and angulation of the transplanted hair, play a vital role in the results and appearance. Here at The Hairfront, our resident surgeon has been trained to the highest exacting international standards. Call us now for a consultation. 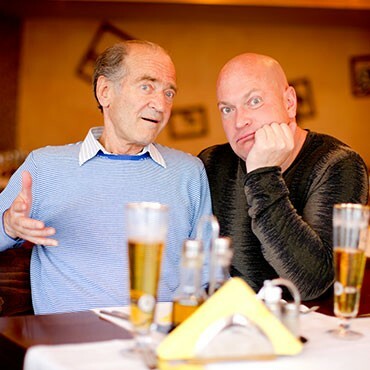 The primary genetic influence regarding baldness does come from the mother’s side of the family, however, there are other contributing factors as well. For example, if your father is bald, you are more likely to develop male pattern baldness than those who do not. Chat to us now for advice on the cause of your hair loss and we can advise on the appropriate treatment accordingly. The internet is awash with information regarding hair loss. Many treatments and supplements are sold online with little clinical data to support their effectivity. The gold standard in clinical research is published RCT (randomised controlled trials). Look out for these when doing your research. Currently, there are no RCT to prove that natural supplements can aid in hair loss. While there is some evidence that they can reduce DHT (the hormone involved in hair loss), this does not translate into an improvement in hair growth. Contact us now for more information regarding hair loss, as well as what treatments are effective.